FILE - Migrants, who tried to flee to Europe, travel in a dinghy after they were stopped by Libyan coast guards and made to head to Tripoli, Sept. 29, 2015. As thousands of migrants and refugees flee the African continent for Europe and beyond, some are looking for new ways to make people’s lives better on their home continent. More than 50 countries including United States, Britain and European countries made a financial pledge to support nations that are large sources of refugees and migrants. Together, they have pledged to increase contributions in 2016 by $4.5 billion, including $1 billion from the United States. The commitments were made during the Leaders’ Summit on Refugees, convened by U.S. President Barack Obama during the U.N. General Assembly. 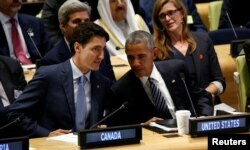 U.S. President Barack Obama talks with Canadian Prime Minister Justin Trudeau (L) at the Refugee Summit during the United Nations General Assembly in New York, Sept. 20, 2016. This commitment signals a shift from a purely humanitarian response, which is typically used to address refugee movements, but doesn’t get to the root cause of the problem, said Jenifer Fenton, the public information officer at the Office of the United Nations High Commissioner for Refugees (UNHCR). One example of a commitment made to change the lives of refugees and migrants was made by the European Investment Bank (EIB). The bank which is run by the European Union was approached by the government of Ethiopia with a proposal to build four integrated agro-industrial parks during the next three to five years spread across different parts of the country and offer jobs to refugees. The EIB has pledged to provide $200 million and an additional $300 million in funding will be provided by the European Commission, European Union, the World Bank, and the United Kingdom. Patrick Walsh, the deputy director general of Global Operations Outside the EU for the EIB said the parks will allow entrepreneurs shared access to resources like roads, water and electricity. "The big advantage of these industrial parks, in this case agro industrial parks, is that you equip together a number of companies in different sectors and you provide common services which really makes it easier for companies and entrepreneurs to come together,” he said. Ethiopia has prioritized the building of industrial parks for several years and the country has seen growth in its exports of leather, coffee, textiles, cut flowers and other products. The country has identified 17 possible areas for agro-industrial parks and has created an Industrial Parks Development Corporation to oversee the plan. Ethiopia has a stated goal of becoming a middle-income country by 2025 and becoming the hub of the light-manufacturing on the African continent. A stipulation of the EIB funding for the parks is that they offer job opportunities for refugees. The parks are expected to offer 30,000 jobs to refugees out of the 100,000 jobs created. Ethiopia is home to more than 700,000 displaced people from surrounding countries including South Sudan, Somalia and Eritrea. FILE - Refugees rest outside in an open area as there is lack of tents at the Dollo Ado refugee camp, Ethiopia, July 7, 2011. “We see our role there as contributing, helping the governments to create jobs so that people don’t have to take these dangerous migratory journeys outside of their countries,” Walsh said. If done correctly, the EIB and other stakeholders hope this could be a win-win, both boosting Ethiopia’s economy and decreasing the flow of migrants to Europe.